The Gong Practitioner Training Course is a certificated training programme over five weekends, over the period of one year. Completion of this training will give participants the information, knowledge and tools required to become a specialist gong practitioner. The world of the gong and its use for healing is an extensive, fascinating and little-known subject. This course aims to bring together and impart as much relevant knowledge and wisdom, ancient and new, as is possible in the time allotted for the course. Some of this knowledge was lost in the mists of time and rediscovered during the last century. Students are encouraged to do their own reading and studies between sessions to further promote their training. Homework will be allotted after each session, and case studies required for certification. A short written exam will be set at the end of the course. 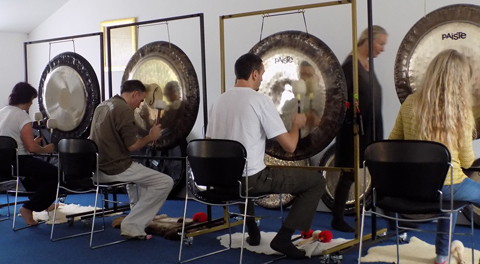 Each participant will need to have use of their own gong by the 2nd session. Write a 2000-word essay on an esoteric sound-related subject of your choice. Do 36 case studies, documented in paper form. No more than three treatments per subject/case study, so at least 12 different subjects are needed. Finished case studies to be written up as completed and handed in to Tutor at each session, to allow for giving feedback. Submit a 2000-word thesis on an esoteric sound-related subject of their choice, to be completed and submitted by Session 4. Arrange and give a group gongbath solo. Write and submit a report to Tutor at next session. Pass a short written exam at Session 4. Know the Universal Greeting and associated hand movements by heart. Have an awareness of Gongmaster and Sound Healing practise Ethics/Code of Conduct. Have attended all Levels 1 - 4 weekend sessions and the Graduation Weekend. Own or have use of an appropriate high quality gong, mallets and associated tools and instruments. It is helpful if participants have had some experience of healing before attending the course. There will be a practical evaluation during Session 3 in which the participants will have to give a supervised gong therapy treatment to another student. Thirty-six practice treatments (Case studies) will need to be carried out and written up to complete the course. Students will also need to complete a 2,000 word essay, and pass a short written examination. At the end of the course, if participants have satisfactorily completed their 36 case studies plus all other coursework, and practitioner assessments, with full attendance at all five sessions, they will be presented with their Gong Practitioner's certificate by the College. To receive their Gong Practitioner's certificate students will need to join the College as Student Members. 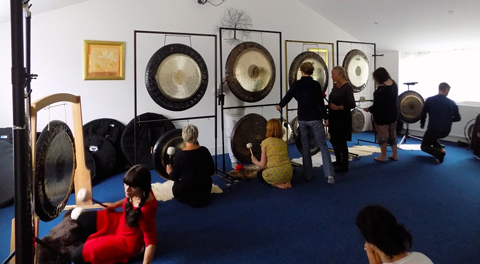 As well as completing the Gong curriculum students will need to complete one or two additional Sound Healing Workshops to become full College members. These workshops can be taken before or during attending the Gong Course. Once they have qualified, College Members are expected to choose activities to fulfil a minimum of 20 hours Continuing Professional Development. The cost is £200 per weekend workshop. 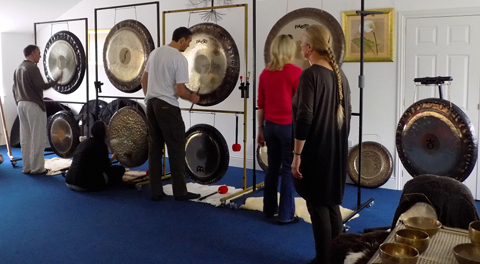 The total cost of the Gong Practitioner Training course is £1,000. Any payments made for the course are non refundable. Students will need to join the College as a Student Member (Student Membership costs £30 for two years which will allow you sufficient time to complete the course) and have insurance cover while they are training. Students will need to purchase a gong, mallets and other instruments for use during the course. The College has a Block Insurance Scheme. The premiums are £35.50 for Student Members and £53.25 for Graduates in the UK. Students need to have insurance cover while they are undergoing the Gong Practitioner Training. Practitioners who already have insurance cover may be able to add Gong Healing to their existing policy at no extra charge. 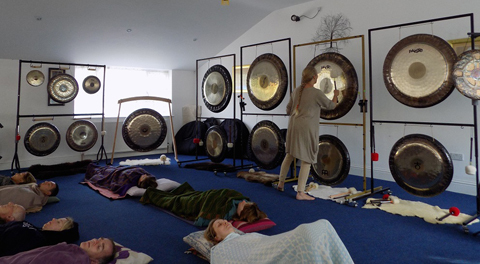 Gong Practitioner Training Tutor Sheila Whittaker's books ‘Sound Healing With Gongs’ and ‘In the Heart of the Gong Space’ can be ordered by going to - www.healing-sound.co.uk - and then following the links to the Online Shop, Books section. Andy: "Just to say I have thoroughly enjoyed the course and its been an honour to work with you and Pauline - thanks so much for sharing you skills, knowledge and enthusiasm. The Graduation performances were wonderful and I feel that we students were able to gel as gongplayers and performers." Andy H: "A perfect mixture of theory and practical playing – learning how to set up the gongs to treat clients has been invaluable and interesting. Developing my playing and treatment techniques has been very gratifying and has built my understanding and confidence. Thanks." Anna: "The course was a fantastic, magical journey with the gongs. We were guided and enabled along the way in the safe, caring, knowledgeable and intuitive hands of our tutor Sheila Whittaker." Anne: "The Course was awesome and so inspiring. So much information, and so many gongs and ranges to experiment and to learn about. Incredibly well planned, well thought out. I feel blessed to have been a part of it. A truly professional delivery and so much interest." Annelise F: "This course has set me on an incredible journey and completely changed my life. 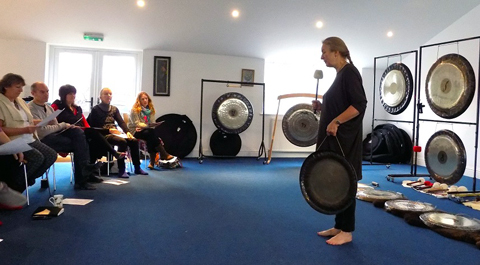 Sheila is an inspiring teacher who imparts her love and knowledge of the gong with grace. She has the ability to bring out the best in her students. Sheila has inspired me in so many ways and provided support when it was needed. I am most grateful for her gentle but firm style of teaching. The course was delivered with grace, gentleness and generosity of spirit for which I am eternally grateful." David: "Truly life transforming. A very professionally organised Course, but not without the love, care and support necessary during a period of metamorphosis. I cannot recommend this Course, and particularly the tutorage of Sheila Whittaker, highly enough." 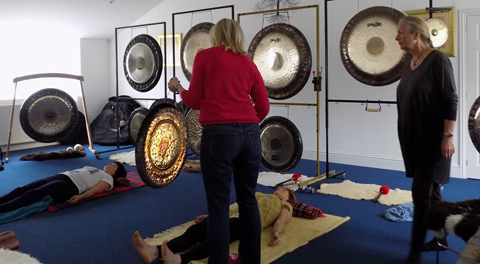 Diana: "I trained with Sheila Whittaker as a Gong Practitioner. It was a life transforming experience for me, and brought together my previous energy work and training and showed me the focus and direction I should take. Sheila is a wonderful teacher and the course was a rich mixture of gentle discipline and rigour, and ethereal intuition. I had always felt something was missing in my energy work and this course was it, and through it I also found the family of the College of Sound Healing." Elaine: "I thoroughly enjoyed the course. It teaches you to listen and hear the gongs as well as sound. Sheila has expertly and sensitively guided me through the programme. Pauline was always there in close support. The whole environment felt supportive. The people were extraordinary and the gongs phenomenal!" Janet: "A wonderful start to what I hope will be a lifetime of working with the gongs. Thank you." Julian: "A well structured Course - with a strong sense of cohesion, as well as being supported with great care by tutor." Julie: "This training has been a game-changer for myself in respect to my relationship with sound - and my life! Having a year-long course gives you a chance to learn, practise and consolidate a diverse array of skills, and also enables you to take the work out into the community and connect with the wider world. Thank you Sheila, thank you Pauline for your support, and gentle but inspiring leadership. It's been an amazing year." 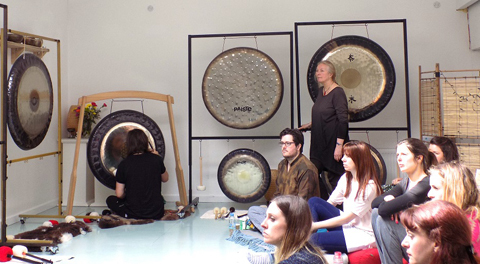 Karen: "I've really loved the gong course and the life journey it has put me on. I've connected with the other students and have felt nurtured within the group. Sheila has been supportive and understanding. I'm very excited for the future and working with the gongs." Maggie: "The honesty, beauty, gifts and wisdom that Sheila brings to everything she does, makes this Gong Course the very best of its kind. We are blessed to be given this teaching and mentorship which extends beyond the classroom to transform us all at a very soul level, turning us into better, brighter ambassadors for the Sound/Light/Colour healing rays. Thank you, thank you, thank you for all you have taught me, and for your amazing example and professionalism. With love." Michael G: "This course has been for me life-changing. Sheila has opened a door into a world of sound that I had never realised was there. Thank you." Pam C: "Truly inspirational, life affirming experience. Words are inadequate to describe. So I will simply say Thank you. Brightest blessings and love." Paul: "This Course has provided me with an amazing opportunity to learn, grow and experience first hand the power and wonder of playing the gong. The carefully planned practical sessions have enabled me to learn new techniques and develop my ability and confidence to play in a safe, supportive environment. But the Course goes beyond this : I have learnt more about myself in the last year, in relation to both my inner and exterior world. I've become more authentic in myself and actions, I have made new friends, and have a real positive sense of future possibilities. Thank you so much for this Course and for sharing the gong." Paul C: "Thanks you for a brilliant course, with great depth and breadth in the teaching. This had added a fun and absorbing dimension to my life which I will use for the wellbeing of myself and others. Love your patient and helpful tuition." Pauline: "If you'd like to play the gongs and inculcate them in your life Sheila is an excellent tutor. Am coming to the end of my training and it has really been an amazing, gentle and insightful year. Thank you Sheila." 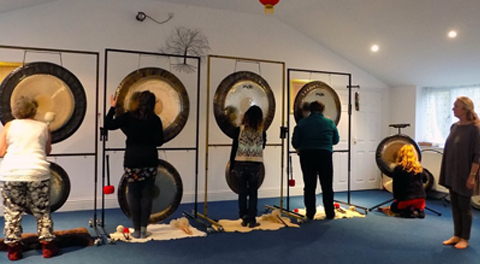 Pauline: "Sheila Whittaker is a very experienced Gongmaster as well as being a very experienced teacher; always creating a safe, non-judgmental and nurturing space in which to work. The course also develops the skill of working with other instruments; weaving them into the gongbath, as well as giving a much deeper understanding of sound. This course is not only valuable, but I feel, an essential requirement for anyone wishing to work with the gong in a healing capacity." Rodger: "I am so grateful to Sheila for such a loving and inclusive training. This Course has brought me such a lot to reflect on and increased my awareness. I would thoroughly recommend this Course to anyone looking for a heart-opening experience, and for inspiration and a chance to learn new skills." Sally: "This was an amazing course, each weekend brought something new. I learnt a lot, lovely people, great venue, wonderful teacher. Thank you." Sarah: "It has been quite a journey - challenging but wouldn't have changed any of it. Thank you Sheila for all the support throughout the process. I am looking forward to being able to move this into my centre very soon as I already have a lot of clients waiting." Scania: "Amazing course, really transformed my life. Thanks for the experience." Tracy: "Truly magical experience. Thanks to all and for you Sheila for your heart felt guidance. I feel so much great change of many lifetimes of wading through lots of karma. Profound deepening and channelling of energies are beginning to come through. A beautiful course that has been delivered with love, vast knowledge and wisdom from the highest source. Big thank you from my heart." There are no Video Testimonials available at this time. Many of the gongs I use are large high quality gongs made principally by the Paiste Company, as well as the Broder Oetken and Meinl gongs (also made by Broder). Most of the gongs used at my workshops will be over 32 inches in diameter. We do use smaller gongs too. 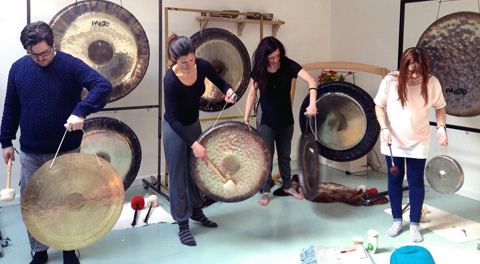 The large gongs have a huge range of tones and are, therefore, capable of producing an enormous amount of sound. There is a huge amount of power in a large gong. However, I never use the full volume of a large gong. It just is not necessary to bring the sound right up to "the flame" (white noise). I rarely take the sound over 70% of the volume that the gong is capable of. Occasionally during a course I may demonstrate to my students bringing the volume up to the flame, so that they know how it feels. Playing the gong is a very sacred and profound experience, not to be done for show or theatrical effect. The gong is an ancient sacred healing instrument capable of enormous healing power, and needs to be treated with respect and reverence at all times. In all the years I have been playing, I have used the flame in performance or gongbath situations maybe only 6 times, when it felt right. We don't need to use the whole volume of a large symphonic gong that has the broadest range of tones. If the gong is played sensitively and well, building up the layers of sound gradually and allowing the gong sound to blossom in its own way and time we will have copious layers of healing overtones and harmonics produced without needing to bring the volume up high. It's all in the way the gong is played. We can do great healing work at lower volumes, if we play it in the right way and with a respectful attitude, gradually coaxing out the layers of sound. A slow build-up can be incredibly powerful and dramatic if it is done gradually over several minutes or longer. Waves of rising and falling sound can be produced in this way too. Obviously we need a certain amount of volume in order to achieve the many layers of sound that can be brought out of the gong by sensitive playing, but it should not be overdone. Taking time to build up the sound and bring in the many layers is a skill, and one which does not come overnight. It takes practise, and we get better at it the more we do, and the more experienced we become. We need to remember that the gong is in charge, and we are just there facilitating. The gong should not be played from the ego; this allows no room for the natural flow, which happens spontaneously when we let the gong lead us. The gong produces the sounds that are needed, and rarely, if ever, will the gong need to be brought up to anything like full volume. If done insensitively or suddenly, this can be shocking and traumatic. The size of the space we are using, and the proximity of the attendees, also needs to be taken into account when playing a gong. If you are playing outside for instance, higher volumes are necessary as the sound has a larger space to fill. In a large inside space, like a concert hall or church, higher volumes are needed to fill the space. Conversely, in a small inside space more care is needed, so as not to overwhelm those listening with too much sound. If your client is right next to the gongs, even more care is required, especially near the head and ears. With new clients who haven't experienced the gongs before (always ask before starting if anyone is new to the gong), more care is needed. Sensitivity and adapting to the situation is the key. Regarding the centre of the gong, my feeling is that the centre is the heart of the gong, and is hallowed ground, a sacred space. I rarely play in the centre for this reason, and feel it's not really appropriate. The main playing area on a Paiste gong is the scraped part, and the rim. These areas offer ample opportunities to make a hugely varied range of sounds (also using a variety of mallets) without needing to play in the centre.